February 29, 2012 - Race officials for the 2012 EAA AirVenture Cup race have finalized the race course for this year’s cross-country race, scheduled to take place on Sunday, July 22, 2012 in advance of the EAA AirVenture fly-in in Oshkosh, WI. This year’s race will commence in Mitchell, SD (KMHE) and end in West Bend, WI (KETB), with checkpoints in Sheldon, IA (KSHL) and Pocahontas, IA (KPOH), totaling 450 miles. The race will have 11 classes of homebuilt aircraft, some of which reach speeds of 400 mph. The competition is a timed race, meaning that each aircraft will take-off individually and fly in pursuit of the best time. The times are used to determine final race results. Cross country air racing has a long history in the U.S., starting in the early 1920s, and has been credited with many advances in aviation technology, speed and reliability of engines. The organization’s goal is to combine aviation history with innovation, new technologies and individual craftsmanship into one high-octane, fun-filled race that participants and spectators alike will enjoy. Upon completion of the July 22 race in West Bend, the aircraft will depart for Wittman Regional Airport in Oshkosh, where they are scheduled for a mass arrival that afternoon. The awards banquet will be held later that evening when the winners will be announced. The race aircraft will be on display for the remainder of the week in the homebuilt parking area just north of the new International Aerobatic Club building on the AirVenture grounds. Each summer EAA presents the largest annual general aviation event in the world, 'EAA AirVenture Oshkosh', also commonly known as the "Oshkosh Airshow". During the event, the city's airport, Wittman Regional Airport, is the busiest airport in the world (in terms of traffic movements). 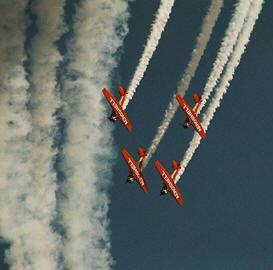 The week-long event annually attracts around 10,000-12,000 planes and a total attendance of more than 500,000. The event also attracts more than 800 exhibitors, hosts nearly 1,000 forums, seminars and workshops, and welcomes more than 700 journalists each year. The annual fly-in was first held at the Rockford, Illinois airport. Attendance at the fly-in continued to grow until the Rockford airport was too small to accommodate the crowds, and so it was moved to Oshkosh in 1970. A study conducted in 2008 by the University of Wisconsin–Oshkosh determined that the 500,000 annual fly in attendance generates $110 million of tourist income for the three counties surrounding the airport. The EAA also sponsors the Young Eagles program, which was started in 1992 with the aim of giving one million children an airplane ride by 17 December 2003, the Centennial of Flight (see Wright brothers). The program reached that goal, and has continued approaching 1.5 million rides by late 2009. The Young Eagles program has been overseen by a series of nationally-famous chairmen, Cliff Robertson - first chairman, film and stage actor (1992–1994), US Air Force General Chuck Yeager first man to fly faster than the speed of sound (1994–2004), Harrison Ford film and stage actor (2004–2009) and Chesley Sullenberger and Jeffrey B. Skiles pilots of US Airways Flight 1549 (2009–present).